Update, May 14: Avalanche Studios are developing Rage 2. The arrival of the Rage 2 trailer earlier this afternoon was arguably the worst kept secret in gaming. After a string of teasers, as well as an eventual leak, the trailer’s arrival might as well have been shouted from Bethesda’s rooftops. That makes a lot of sense when you watch the trailer (you can do so at the top of this article) as there’s an extremely Mad-Max-meets-Borderlands vibe to the whole affair, so having the team that made what was by all accounts a very good Mad Max game on board makes a lot of sense. Update, May 14: In a move that will undoubtedly surprise the entire internet, Bethesda has announced Rage 2, the sequel to id Software’s 2011 shooter. You can see the full teaser trailer below. Various elements from the original Rage can be spotted in that very-pink video, including the mutants, bandits, vehicles, and the game’s iconic lethal boomerang the Wingstick. Bethesda will show more details about the game tomorrow, May 15, at 10:00 ET / 15:00 BST – including a gameplay trailer. The road to this reveal has been slightly humiliating for Bethesda, including an accidental reveal of the game byWalMart Canadaand a leak of the trailer this morning (see original story, below). Of particular note, however, is the totally absence so far of any mention of id Software. As the original developers, and coming off the back of 2016’s wonderful Doom reboot, their name should have appeared somewhere if they’re working on the sequel. It’s possible they may have their hands full with Doom and Quake Champions and another team could be taking over. Guess we’ll find out tomorrow. Original story:Since the Walmart Canada kerfuffle last week, where a string of unannounced games were purportedly leaked through the stores digital shop, Bethesda have been teasing an announcement to do with 5 14 – probably May 14th. Now, it looks like that, too, has leaked. 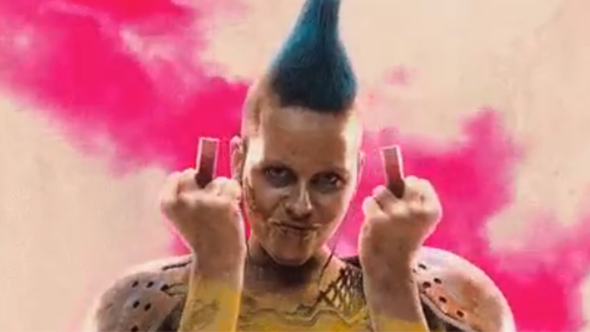 The Rage 2 trailer has gone up early and it’s full of people with irradiated skin, missing digits, and bad teeth. The video itself has been taken down already but not before a short GIF was made of its major contents, all of which can be seen in Wario64’s tweet below. The GIF doesn’t feature any in-game footage – not unless id Tech has come on leaps and bounds and reached photorealistic levels – but it reveals a gaudy, colourful Mad Max-style world. The trailer also shows off a number of different regions, from deserts, to forests, to abandoned cities, to the interiors of futuristic facilities covered in glowing neon. Considering Bethesda’s Rage account had been throwing shade at Walmart for the Rage 2 leak, suggesting it was all a fake, Walmart’s social media team are probably pointing at their computers and making a Nelson Muntz-style life at the moment.